CPU Temperature Monitor Core Temp is a compact, no fuss, small footprint tool to monitor CPU temperature. 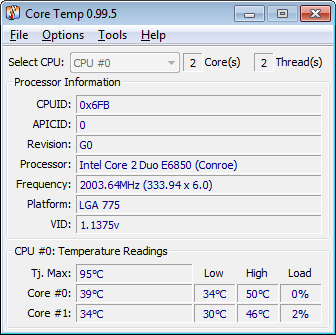 Core Temp shows the temperature of each individual core in each processor in your system! You can see in real time how the CPU temperature varies when you load your CPU. It's also completely motherboard independent. Core Temp also has a logging feature, allowing a user to easily record the temperature of his processor over any period of time. compact, no fuss, small footprint CPU Temp monitor for CPU temperature monitor. ...... Temperature Monitor Core Temp also has a logging feature, allowing a user to easily record the temperature of his processor(s) over any period of time, then the data can be easily transferred into an excel datasheet for easy graphing. CPU Temperature Monitor Core Temp works on Windows 2000, XP, 2003 and Vista (32bit &64bit). Thanks to CoolIT Systems for providing a digitally signed CPU Temperature Monitor Core Temp driver which now works on all Vista versions. Just download CPU Temperature Monitor Core Temp to have a try now! Single Core Opterons starting with SH-C0 revision and up. All Dual Core Opteron series. Qweas is providing links to CPU Temperature Monitor Core Temp 2010 as a courtesy, and makes no representations regarding CPU Temperature Monitor Core Temp or any other applications or any information related thereto. Any questions, complaints or claims regarding this application CPU Temperature Monitor Core Temp 2010 must be directed to the appropriate software vendor. You may click the publisher link of CPU Temperature Monitor Core Temp on the top of this page to get more details about the vendor.